Water Direct provides water for agriculture and irrigation purposes, water is an essential part of maintaining agricultural land as well as providing for plants and livestock on farms. Irrigation is the practice of providing a consistent water supply to plants, crops, foliage and grass. Whilst it is commonly associated with farming, agriculture and horticulture, irrigation is required in many situations where the maintenance of plants and foliage is crucial. This can include everything from lawns and pitches at sporting venues like football grounds, to large commercial premises that feature communal or decorative gardens. These all require frequent and effective watering to maintain their quality and survival. 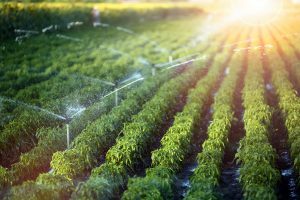 Recent prolonged periods of low rainfall and unseasonable frost have brought increased demand to irrigation systems, while a drought order or ‘hosepipe ban’ could mean that you need to outsource a water supply altogether. We specialise in providing bulk water supplies suitable for all irrigation systems, regardless of the industry. Whether you’re a greenskeeper looking to keep the 18th hole at its best or a farmer needing that bit of extra help during a busy or dry season, Water Direct can help.Our ability to meet our customers’ needs is what separates us from the competition. To that end, all of our water is quality assured and maintained to the highest level through a series of sampling and recording processes. This helps prevent any water pollution worries that you might have. Whether it’s planned or on an emergency basis, our bulk water supplies can be delivered quickly, nationwide.